May to meet Merkel, Macron ahead of crucial Brexit summit - Integration Through Media ....! LONDON, (AFP) – British Prime Minister Theresa May will meet with German and French leaders Angela Merkel and Emmanuel Macron as she scrambles to find a Brexit breakthrough ahead of Wednesday’s crucial EU summit. May will meet the two leaders on Tuesday, their offices announced on Monday, the day before the summit where she is expected to ask the bloc for another delay to Brexit. Britain will fall out of the European Union without a deal on Friday if no delay agreement is reached. “The chancellor and the British prime minister will have an exchange of views on Britain’s exit from the EU as well as on Wednesday’s special summit of the European Council,” said Merkel’s spokesman Steffen Seibert. May was on Monday to press ahead with her bid to find a “compromise” with the opposition Labour Party despite a backlash from her own Conservatives. “Our intention is to engage further with the opposition today … and we hope that will lead to formal face-to-face discussions” later Monday, a Downing Street spokeswoman said. Having failed three times to get her withdrawal deal through parliament, May has been locked in talks with Labour to find a modified plan that could command a majority. 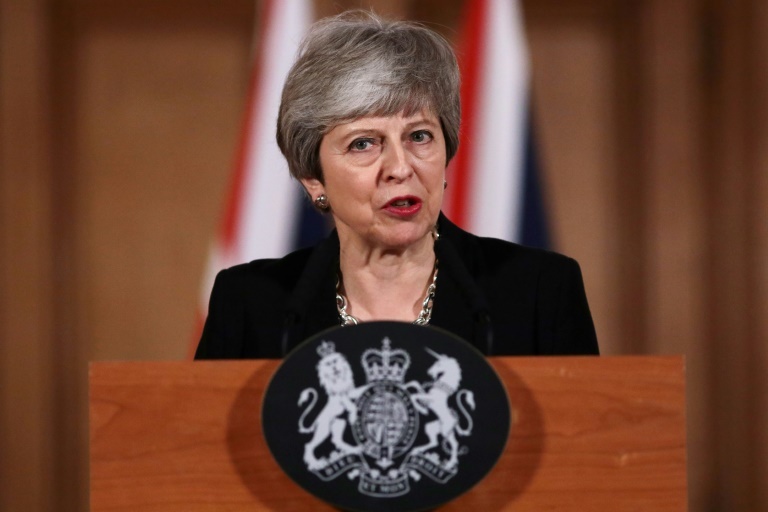 “It’ll mean compromise on both sides but I believe that delivering Brexit is the most important thing for us,” she said in a video message released on Sunday. Labour wants a customs union with Brussels, something May consistently ruled out as it would prevent Britain striking trade deals with the rest of the world. The talks broke down last week, with Labour leader Jeremy Corbyn saying, “I’m waiting to see the red lines move”. Labour is also facing internal division, with 80 MPs writing to Corbyn urging him to secure a guarantee of a second referendum in any deal. Leading Brexit supporter Boris Johnson, the favourite to take over once May leaves, said the prime minister’s talks with veteran leftist Corbyn were “so disheartening that you can scarcely believe it”. “It seems utterly incredible that he has now been invited into Downing Street to negotiate a Brexit deal,” he wrote in his Daily Telegraph column. May’s deal includes the legally binding terms of Britain’s withdrawal, and also a political declaration outlining the principles of a future relationship. She has told restive Conservative MPs she will resign before negotiations on future trade ties begin. Labour could seek to lock the agreement into law, making it much more difficult for May’s successor to change strategy. But Johnson said Britain staying in a customs union, “would make a total and utter nonsense of the referendum result”. May is hoping to have a deal to present to European leaders at the emergency summit on Wednesday, where she must secure another Brexit extension to prevent Britain leaving the bloc at 2300 GMT Friday with no accord. She has asked for a delay until June 30, but the decision has to be taken unanimously by Britain and the remaining EU 27 members. Irish Prime Minister Leo Varadkar said it was “extremely unlikely” a member would veto another extension and revealed he now favoured a lengthy delay. Britain’s parliament is expected later Monday to approve a bill to force the government to delay Brexit. If passed, May will have to bring a motion to parliament on Tuesday, pledging to request an extension in Brussels and outlining the length of the planned for delay.